Yoghurt has a lot going for it. Not only is it healthy and a fantastic aid for your digestive system, but also extremely cheap to produce. Yoghurt is so versatile because it can be eaten at any time during the day, either as part of a meal or a quick, healthy snack. It can be combined with a multitude of different flavours – accompanied with fruit, compotes and honey to make sweet deserts, or combined with savoury flavours such as garlic, mint and avocado to create smooth, fresh dips, sauces and accompaniments. So it’s no surprise to learn that making your own yoghurt is fantastically easy. Although there are many electrical yoghurt-making appliances commercially available, the good news is that you don’t have to spend a fortune on such gadgets. 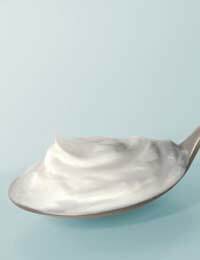 This article reveals how to make gorgeously tasty thick natural yoghurt in the comfort of your own kitchen. The type of milk you use to make your yoghurt will affect the thickness of the final product. Skimmed milk will produce thinner yoghurt, whereas semi-skimmed and full fat or whole milk will produce a much thicker, creamier yoghurt. You can also make a Greek style yoghurt by opting for whole milk, following the instructions below and then straining the yoghurt though a muslin bag. You will need to begin by taking 2 pints of milk and pour straight into the pan. If you’re looking to flavour and sweeten your finished yoghurt, at this stage you could add a couple of teaspoons of honey to the unheated, empty saucepan. This helps to prevent the milk burning, as well as adding a little extra sweetness to the yoghurt. Place the saucepan lid on and very gently heat the milk for around half an hour. After this time a skin should start to form on the milk. Once the skin has fully formed, leave the milk for a few minutes. Then, taking your thermometer, allow the temperature of the milk to fall to around 46 degrees C/115 degrees F.
At this point you can take 1-2 tablespoons of your live yoghurt. This acts as a ‘starter culture’ that will activate and help turn the milk into yoghurt. Make sure to thoroughly mix the yoghurt into the milk, whilst retaining the temperature. You will then need to transfer the mixture into a warm vessel. This can either be a pre-warmed vacuum flask (plunged in water at 46 degrees C to maintain warmth inside the flask), or a sterilised bowl. The bowl should then be covered and wrapped in towels, or placed into another sealable container of water at 46 degrees C, making sure to keep the levels of water and yoghurt mixture level (but separate!). Seal the container and set aside for around 8 hours, or overnight. Take care not to disturb the mixture, and try to keep it at the same temperature throughout the process. There are special heat pads that can be bought to help with this task; alternatively, you can stow the vessel in an airing cupboard! The result should be wonderfully creamy and smooth natural yoghurt. As aforementioned, if you’re after a really thick yoghurt, strain the mixture through a muslin bag. This may also remove some of the bitterness. Make sure to store your homemade yoghurt in the fridge, and use within around a week – if you manage to make it last that long! I bought a mains electricity yoghurt maker which works very well. It says in the instructions you don't need to heat longlife milk but you have to with all types. Here's what I do: I take a litre of skimmed milk and heat it slightly not boil it. I put it into the yoghurt maker with a teaspoon of live yoghurt and leave it for 8 hours usually overnight. Then if you want to drain it because there is too much clear liquid which is usually the case ,you can use those very cheap blue and white clothes on a roll or muslin. Put the cloth in a sieve and leave it to drain over a bowl.